RTP-area toll road lightly used, bleeding money. State: Let’s do SOME MORE !!! The brand new Triangle Expressway stretching 19 miles through Wake and Durham counties makes it easy for drivers to bypass smaller, slower, and overcrowded roads. “I think the road is excellent and fabulous and it’s new and I like it,” driver Carolyn Barrett told ABC11 recently. “It’s quick. It’s just really fast. I can bypass any traffic. I really haven’t gotten into any traffic when I use 540,” driver Canya Meikle explained. But using the new highway isn’t free, and that’s a turnoff for some. “I don’t want to pay for it. I don’t want to pay a toll,” said driver Aubrey Herrera. “It seems like people are avoiding it,” said driver Gordon Pruitt. Pruitt tried out the road when a trial free period was offered right after it opened, but now he can’t justify spending the $750 a year he estimates it would cost him to use it regularly. “The reason I don’t use it now is just the cost that the toll pretty much has put on my pocketbook,” he explained. Pruitt isn’t alone. During some parts of the day, the highway is practically empty of traffic. “I choose to take other side roads and side routes to avoid the monthly expense,” said Pruitt. Is the fact that some are avoiding the road affecting its bottom line? The I-Team decided to look at the expenses versus profits of the Triangle Expressway and found the toll road is currently losing millions. It’s paying for those operating losses with borrowed money from construction bonds. So, is it a failing business model? “We’re in the first year of a 30-year term. So I think it’s very early to determine that,” said Jim Trogdon with the NCDOT. According to the balance sheet obtained by the I-Team – and never made public until now – in the 2011 fiscal year, the turnpike authority had an operating loss of $3.8 million. The loss was $11.5 million in the 2012 fiscal year. In the 2012 calendar year, the losses continued. During first full year of toll collections – the project had $12.2 million in expenses and $4 million in revenue – meaning it was in the red by $8.2 million. And that’s just the cost of things like personnel, supplies, travel, advertising, and rent. It does not include the interest the NCDOT pays out on construction bonds. That amounts to $35.6 million this fiscal year. So is there cause for concern? “We recently had a review by our bond rating agencies and they found no shortcoming in our process so far,” said Trogdon. Trogdon – the number two man at the NCDOT – says things are going according to plan. He points out the traffic count – the number of vehicles on the road every day – is growing quickly – now up to 60,000. That means revenue is also growing. The NCDOT expects to collect $10 million in tolls this fiscal year. That’s an improvement, but still not enough to cover overhead expenses. “You always have more expenditures in the initial years and your income comes in the later years,” Trogdon explained. Trogdon said that was the plan all along. “Oh, absolutely, all your expenses are up front,” he said. The NCDOT sold bonds to pay for 63 percent of the cost to build the billion dollar highway. Thirty-seven percent of the cost came from taxpayers. That works out to $25 million taxpayer dollars a year. Trogdon said taxpayers are getting their money’s worth. The I-Team also crunched other numbers to gauge the success of the turnpike. We looked at actual vehicle counts compared to the state’s targets for 2013. The actual number is lower on many sections. It’s 30 percent below projections through Cary, Apex and Holly Springs. It’s a whopping 60 percent below projections on the Hwy 147 stretch approaching I-40 in Durham County. We asked Trogdon if the tolls are too high. But drivers like Gordon Pruitt say they’d be more likely to use the road if it was cheaper. The NCDOT said that’s not surprising. It says we’re in a period they call the “socialization” of the toll way – and they believe when we’re used to the idea of paying a toll to drive, more of us will do it. The DOT also says overall – along the entire 19-mile stretch of highway – it is meeting projections for ridership and revenue. It also says the road won’t break even for another decade. It expects tolls will cover the cost of debt service, operations and maintenance, and major repair and renovation in 2024. The Triangle Expressway is touted by HOT lane proponents in Mecklenburg County as a success story. The facts say otherwise. Revelations like what came out in this news story haven’t done a thing to sway the “conservative revolution” in Raleigh. The NC House has voted to allow tolls on I-95 and on other major roads in the state. Politicians enjoy gimmicks like this that obscure the fact that they are attempting to confiscate MORE money from their constituents. Ever hear a city councilman brag about how residents will save money because “THE COUNTY” is paying for a program? Ever hear a county commissioner boast about how his “people” will save money because “THE STATE” is paying for something. What dishonesty. ALL OF THAT MONEY COMES FROM THE SAME SOURCE: US !!!!!!! Toll roads give the ruling class an opportunity to swipe more money from us — to buy our votes with more waste and largesse — without having to directly vote for a tax increase. We especially like the “socialization” aspect. 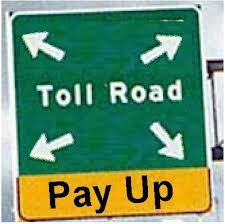 When we get used to the idea paying tolls, we will comply. That is just screaming “YOU WILL BE CONTROLLED!” We’re like frogs in a pot!